Apricots have a mysterious healing effect on the heart. 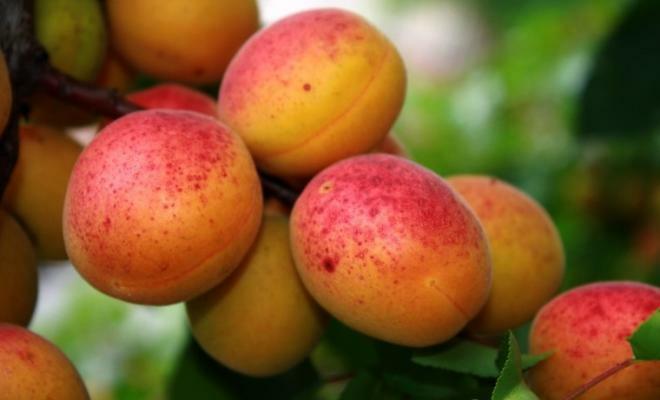 In latin, apricot means “precious”. The small orange-dairy fruit is not very juicy, but definitely sweet and very rich in potassium. Potassium is a trace element, which is located in the water of the cell. The biochemical role consists in its effect on the enzyme sodium / potassium – ATPase (Na / K-ATPase). This is an enzyme that is crucial. It transports potassium into the cell and sodium out of the cell and maintain a balance of potassium / sodium, it provides the required ion gradient to maintain the proper biological state of the heart. The presence of potassium is of great importance for the functioning of the nerves and muscles. It stimulates the retention of nitrogen, promotes the glycogen metabolism and thus increases muscle mass and stimulates muscle hypertrophy. The heart is the most important muscle in our body and the shortage of potassium can lead to acute heart disorders that can lead to cardiac arrest. The most common apricots ripen from late June to early August, and mostly – in the second half of July. Period in which you can consume them fresh is not very big, but dried apricots are not less useful. They contain 4 times more potassium than the fresh fruit. Besides rich in potassium, apricots contain magnesium, which lower high blood pressure for a long time. In hypertension during the season of ripening them, all cardiologists advise to eat as many apricots as you can. 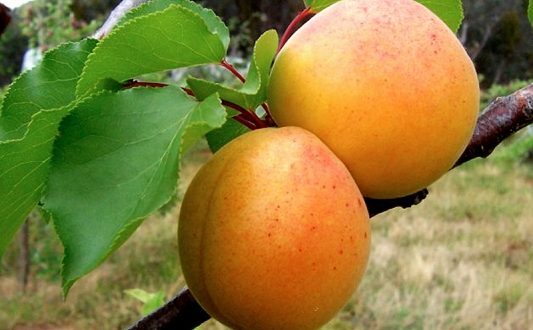 The apricot is the only fruit, which has a stone that can be used for food. 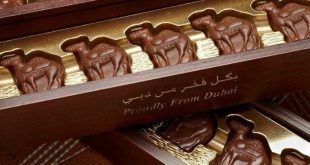 It is rich in fats, salts and proteins and is involved in many confectionery recipes. Furthermore, nuts stones from apricots soothe irritating cough, tracheitis, bronchitis, laryngitis. In patients with heart failure, it is an appropriate treatment since there are no side effects. The recipe is as follows: remove the skin from 25 apricot stones and leave them to dry nicely. Then powder them and take 1 t.s. about 3-4 times a day with tea or other liquid. 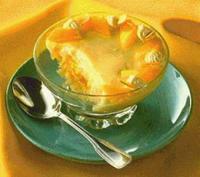 In cardiac arrhythmia, you can make a puree from 5 fresh apricots and mix it with 1 teat cup of ayran. Do this every day. The Consumption of apricots in all their possible forms – nectars, compotes, juices, included in smoothies and more is extremely important to have a healthy heart, so we don’t have to consume them later with a doctor’s prescription. Fruit smoothies should be consumed 20 minutes before the consumption of other dishes – this is the basic rule. Thus there is no danger of fermenting fruit in the stomach and nutrients are readily absorbed by the blood. Apricots are washed and cleaned from the stones. Arranged in a tray covered with baking paper with the insides up. In each piece put sugar tray and put in preheated on 180 degrees oven to seal. Once fruits are constipated, press them. You can keep 1-2 pieces for decoration. Water the gelatin in 2-3 soup spoon cold water and allow it to swell for 10 minutes. Add cognac to it and everything is heated in a water bath until completely dissolved. The mixture should then be added to fruit purée, mix good and place it in the refrigerator to gel. Beat egg whites with vanilla snow. Apart smash cream with part of the sugar. Finally, carefully add egg whites and cream to fruit mixture. Stir and mousse is distributed in dessert glasses. Cool for at least 3 hours in a refrigerator. Serve garnished with baked apricots and mint leaves. Dried apricots are soaked in water until they swell enough. Beat the cream with the sugar. 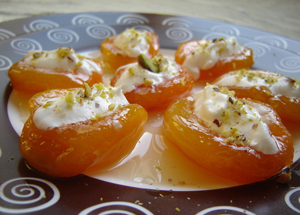 Then swelled apricots are filled with the cream and sprinkle with pistachios. Serve chilled.